Virginia M. English (Mc Mahon) 92 died peacefully at her home on of January 25. Virginia was born in Boston on April 3, 1925 one of five children of the late Martin and Mary (Welch) McMahon. Virginia grew up in Revere and she graduated from Revere High School in 1943. Virginia then continued her education and she graduated from the Whidden Memorial Hospital School of Nursing Class of 1946. Virginia married her husband Edward on April 15, 1950 and together they made their home in Everett and raised their 5 children. Virginia enjoyed many years as a school nurse in the Everett Public Schools and later at the Board of Health for the City of Everett. Virginia retired in 1993 from a job she loved and in which she was continually helping people and giving to others. Besides working as a nurse, she was a loving wife, mother, grandmother and great grandmother. 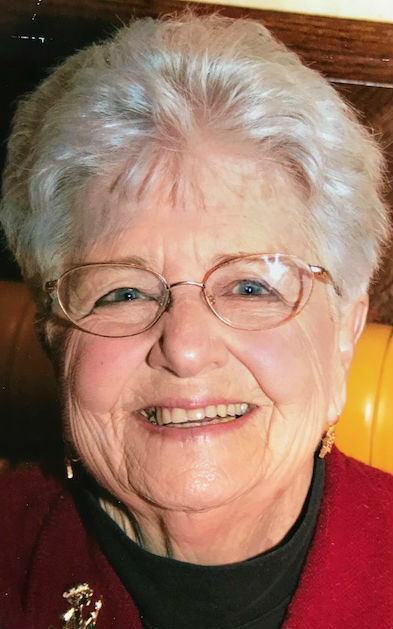 She had a profound effect on those she met both in her nursing career and at home. In her spare time, Virginia loved traveling, bowling, swimming and trips to the Casino. She was the beloved wife of the late Edward “Tuffy” English and loving mother of Mary Ellen Graziani and her husband Vincent of Saugus, Susan English of Wakefield, Edward and his wife Cleo of Everett, Thomas and his wife Paula of Malden and Patrick and his fiancé Tina of Everett. She was the grandmother of Susan, Jill, Peter, Kevin and David and great grandmother of Taya, Talia, Vincent, Briella, Mila, Layla and Braydon. She is also survived by her two sister-in-laws Alberta and Eileen and her cat Toni and many loving nieces and nephews. She was the sister of the late Ruth Shea, Martin McMahon Jr., Robert McMahon and William McMahon. Funeral from the Murphy O’Hara Funeral Home 519 Broadway Everett on Monday at 9am followed by a Funeral Mass in the Immaculate Conception Church at 10am. Visiting hours on Sunday from the funeral home from2 to 6 pm. Interment Glenwood Cemetery. Please make donations in Virginia’s memory to St Jude Hospital PO Box 50 Memphis, TN 38101-9929.